Skin changes are common during hematology & oncology therapies due to a number of reasons and are frequently the result of surgery, chemotherapy, radiation therapy, medications, or some combination thereof. Certified Oncology Estheticians® have undergone extensive education to understand how cancer and therapy treatments affect the body at the dermal and lymphatic level. COEs are thoroughly familiar with medications, side effects, and the importance of proper sanitation. We are proud to offer skin care for radiation therapy to guide a restorative process for our clients’ skin. This treatment addresses the specific needs and concerns of patients undergoing all phases of cancer therapy, as well as recovery and survival, and is customized every step of the way. A safe and soothing treatment to help manage and improve the changes skin undergoes during and after cancer therapy, with the added healing benefits of touch provide a feeling of peace and relaxation. The use of safe, non-toxic, unscented, gentle and healing products help your skin regain a healthy feel and appearance, leaving you looking great and feeling better. A perfect treatment for those who are undergoing more aggressive therapies where there is less ability to work on the body but who will still benefit from the relaxation experience. A gentle, soothing and safe treatment to relieve pain and discomfort can be experienced in the hands and feet. Our scalp treatment involves gently massaging a nourishing serum into the scalp, which relieves tension, produces endorphins and addresses sensitivities that often occur with treatment-induced hair loss. 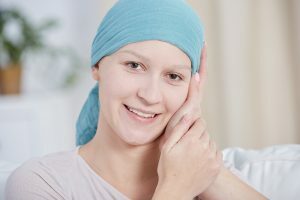 Treatments that involve skin care during chemotherapy are customized to the patient, their type of cancer and their medical treatment regimen to help comfort and soothe side effects of therapy. Please don’t hesitate to call if you have any questions or would like more information regarding our skin care for chemotherapy.